Regardless of how you feel about the man, you are feeling his moment. Even if you are not familiar with his work, you still understand that he very much exists. There’s even a slight chance you can’t match his face or voice to his name. But you’ve seen the face. And you’ve heard the voice. And you know the name. But how? Seriously. How did he do this? Who let this happen? Why can’t we stop it? Do we want it to stop? Do we have a choice? The rise of Kevin Hart is anything but traditional or linear. There wasn’t a true “breakout” role that started it all. He’s been in our faces consistently for a decade now, but that only begins to scratch the surface of his success. Plenty have longevity but never make it out of the ranks of 13th-billed on a film and/or member of the black team on Wild ’N Out. But somehow, Kevin did. How did we get to a point where his movie About Last Night and the first trailer for his sequel Think Like a Man Too are both released on the same occasion that aided in his star turn, NBA All-Star Weekend? About Last Night comes out right after his other movie, the $100 million–grossing Ride Along, whose producers are already in talks about a sequel. Hart’s other other movie, Grudge Match, appeared in a year that already hosted his highly successful fourth stand-up special, Kevin Hart: Let Me Explain, and an ego-stroking role as “Himself” alongside other members of cool, young Hollywood in This Is the End. Explaining Kevin Hart is complicated. So is answering the question “How did he pull this off?” But it’s possible to do both. Kind of. The issue is getting there, which involves swan-diving into a K-hole of one of the most masterfully executed DIY star-making projects in some time. Kevin Hart was born July 6, 1980. And then 25 years later, this happened. It was only two minutes, but Hart co-conspired with Romany Malco to steal The 40-Year-Old Virgin away from Steve Carell. Hart’s character doesn’t even have a name beyond “Smart Tech Customer,” we learn nothing about him before the scene, and once it’s over, we never hear from him again. In a two-minute scene, Hart behaved like a star. But that cameo did not make Hart a star. It’s important to acknowledge what’s happening behind this scene. He was given the role by director Judd Apatow, who gave him a major break three years prior on the show Undeclared. And a decade after Undeclared, that same Judd Apatow recommended Hart for host of the 2012 MTV Video Music Awards. Hart’s entire career has been built up like this. Yes, thanks to comedic talent. But equally because he has good friends. Or, more accurately, the right friends. Apatow has been undeniably important. But not as important as Shaquille O’Neal. Hart owes a sizable portion of his career to O’Neal. It’s true. That fact, on paper, makes no sense, but it also makes perfect sense. Though their primary focuses vary, their arc could not be more similar. 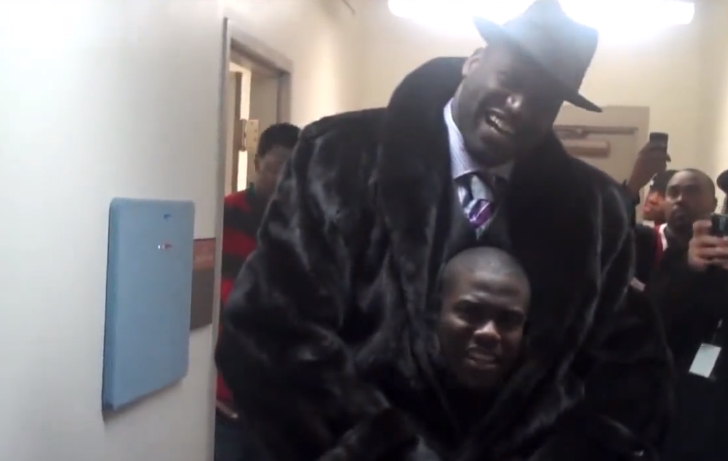 In some ways, there are no more appropriate friends and accomplices than the 5-foot-4 Kevin Hart and the 7-foot-1 O’Neal. Because both men have successfully completed celebrity’s holy trinity. That triangle is one of the most necessary tools to explaining Hart. It’s not about being markedly talented in all three. All that matters is being good enough at one, and then accepted by the other two. In the case of the Big Aristotle, he’s one of the most important players and personalities in professional basketball history. And while not the best rapper ever, he certainly doesn’t approach the worst. That fact, coupled with basketball, gave him friends throughout hip-hop. And then there’s comedy. Beyond being a clown, Shaq one of the champions of promoting black comedians over the past 15 years. Never forget that if there weren’t Shaq-sponsored comedy bashes, there would be no Emmitt Smith roast, and if there were no Emmitt Smith roast, there would be no Jamie Foxx vs. Doug Williams. Hart’s triangulation took a more circuitous route, because he didn’t come in as the no. 1 comedy prospect in the land. Before even beginning to dream about having rapper and athlete friends, he had to first gain respect in his own field. And to do this, he had to perfect his key joke. See, Kevin Hart has one primary shtick. He’s small. That can then manifest itself in a variety of ways. I’m small, hanging out with big people. I’m small, dating’s a trip. I’m small, let’s fight. I’m small, miscellaneous. But regardless of how you manipulate it, it all comes back to him being small. If Kevin Hart were 5-foot-8, he would not be famous for comedy. As a contrast, if you could only hear Richard Pryor jokes on the radio, he would still be famous for comedy. The genius in Hart, however, is that he has found ways to use self-deprecation, extreme honesty, and vulnerability to become amazingly relatable, which makes him a great storyteller. But still, he’s small. The small thing almost didn’t work, though. While talented, Hart also got extremely lucky. Because if his predecessor Katt Williams had found a way to keep it together, there would be no superstar Kevin Hart. Katt Williams: small. Katt Williams: joke for joke, a funnier comedian. Williams’s The Pimp Chronicles, Pt. 1 is one of the most consistently funny stand-up specials. Ever. So even though they are two comedians with wildly different styles and subject matter, a large chunk of Hart’s hopeful lane was already occupied by Williams in the mid-’00s. And, while not impossible, the likelihood of two small black male comedians making it big was very slim. In the early years of the post–Dave Chappelle era, Williams was next in line. He was the breakout star on MTV’s Wild ’N Out, so much so that he became a significantly larger draw than the show’s “real” star and host, Nick Cannon. At that time, while Williams was flourishing on the show, Hart was in the wings. Even as a team captain on Wild ’N Out in 2005’s Season 1, Hart fails to impress. If anything, he’s annoying. Looking back at Williams’s old clips from the show, it’s easy to assume which man will become a star and which will be thought of as a former team captain on Wild ’N Out Season 1. Hart doesn’t seem to mind the awkward height difference. If anything, he’s used it wholly to his favor. Hart, Shaq, and Chris Webber, arms clutched on the TNT set during the NBA Finals, having the actual time of their lives. What happened right before this? Hart made fun of Charles Barkley. He told him his lips would bleed if he smiled fast enough. Was it the funniest joke ever? Absolutely not. But it’s a good joke. And look at the end result. Seriously, look at it again. This reaction to this joke helps explain another part of the rise of Kevin Hart. Because, beyond questions of how, there’s something significantly more nuanced we have to ask. Why are we laughing at Kevin Hart at all? I’m forced to assume there are people out there who, from the first joke they heard, thought Hart was funny. They must exist. I, however, am not one of those people. I’ve spent a good deal of time being slightly annoyed by Hart seemingly recycling the same bit with mildly rearranged components. He’s like Comedy Boggle. But then I submitted myself to the Kevin Hart deep dive. Watching his stand-up specials. Watching his movies. And most important, watching the clips he puts online. When you watch a lot of Hart, your opinion of Hart changes. To say he grows on you only tells part of the story. It’s closer to Hart convincing you that you like him. I didn’t like Kevin Hart, the comedian, until I bought in to Kevin Hart, the guy. You start thinking about his subject matter, and the uncompromising positions he puts himself in, and the energy he’s exerting, and he starts to win you over. And once he’s begun to win you over, the all-out assault begins to get very funny. Like going paintballing with Drake. Or playing basketball against Chris Brown and Ne-Yo. Or being his alter ego, Chocolate Droppa, and freestyle battling in Fabolous’s kitchen or with T-Pain or in a hotel room with the Golden State Warriors. You begin to appreciate the dedication. And the grind. And even the willingness to do apparently anything for some shine. And then you begin to enjoy a world where Hart is casually associating with other famous people, typically rappers and singers and athletes. Almost as if they like having him around. Almost — almost — as if they’re all friends. And then you realize, right under your nose, that he’s completed the trinity. But then you find that you can’t stop watching Hart. Even the most mundane clip is funny. It’s his arsenal of X factors: screaming, being irrationally tough, his deadpan, his characters, actual acting chops, whatever he’s wearing. And then, after watching roughly 100 videos, the magic moment happens. You begin laughing before jokes are delivered. I noticed myself doing this the first time I watched Chappelle’s For What It’s Worth stand-up. I implicitly trusted that he was a funny person. Someone who had made me laugh many times before. And because of that, in my chest and throat and brain, something resembling the early stages of laughter would begin to appear before the joke ever happened. And when a comedian can get a viewer (or an entire audience) to that point, they’ve won. It’s that point where you could say anything, and the audience would find something in it to laugh about. Joke for joke, story for story, Hart is no Chappelle. But he’s living in that sweet spot right now that few comedians ever reach. The one where you can pop up for 10 seconds of a movie trailer, do something mildly funny, and convince the masses to go see your film. And here we are: Kevin Hart, the movie star and arguably the biggest comedian in the world. Even while attempting to explain that, I can’t explain that. But it’s true. The title of his most recent stand-up special, Kevin Hart: Let Me Explain, almost acknowledges that everyone, himself included, is looking for answers as to how it all happened. But by the end of the special, you’ve laughed aplenty. It’s proof that you understand his appeal. Throughout his come-up, Hart has maintained a balance: harmless, but with an edge. He can take a punch, and return the favor. He can mock the typically unmockable (see: Kevin Hart vs. Pusha T and Floyd Mayweather). He can even survive when grossly outnumbered and lacking the home-court advantage (see: Kevin Hart vs. Meek Mill +20). It’s just Kevin being Kevin. It’s why you like having him around. He thrives in these David vs. Goliath social settings. And not just the kind onstage, but in atypical places. Like in random hallways. Someone else’s random hallway. In these settings, in these hallways, the Kevin Hart puzzle begins to come together. In this hallway, we have LeBron, other members of the Cleveland Cavaliers, an assortment of random people, and Hart. He’s been positioned next to LeBron on an imaginary stage. There is nothing notable to talk about. This is not an interview. But in this random hallway, it is Hart’s job to do things. A jester in a king’s court, he has to entertain LeBron, so LeBron can laugh, the cue for everyone else in the hallway to laugh. But in that, he also has to come off as LeBron’s peer, because he’s a part of LeBron’s world. You know, because of the trinity. And, even with no real material or perfectly executed jokes, Hart gets out alive. He always gets out alive in these situations. And the more you watch, the more you root for him to get out alive, when his guard is down and people are looking at him, almost as if they’re curious to see how he’ll simultaneously entertain and escape. It started for Hart in a random hallway with LeBron. But that same LeBron in the hallway is the same LeBron standing up, laughing at his stand-up special, and the same LeBron bringing him along for Samsung commercials. This is what Kevin Hart does. And this is why Kevin Hart keeps winning. Kevin Hart’s completion of the trinity explains why an event like NBA All-Star Weekend has been his to own for three years now. He is it and it is him. He plays in the celebrity game, he convinces you to give him MVP, he has a part in every sketch — even those to which he wasn’t invited — he knows all the celebrities, and he knows all the players. Is it overwhelming at times, his gnatlike persistence? Absolutely. But when he’s released you from his grip — the likelihood of which decreases with every passing month and targeted YouTube ad — his role becomes clear. He’s the glue. He’s the fulcrum. He’s the center of the holy trinity.